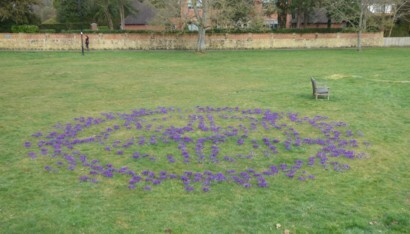 Anyone visiting Cranleigh Common in March will come across an unusual pattern of purple crocuses near the local pond. This colourful display is courtesy of four Cranleigh groups (Cranleigh Rotary, Cranleigh in Bloom, U3A Garden Club and Cranleigh Chamber of Trade). On 12 November 2016, 16 volunteers from these organisations spent two hours planting 6,000 crocus corms on Cranleigh Common. Despite the very inclement weather, the group made every effort to plant the corms in a formation that copied the profile of the traditional Rotary Wheel, as reflected in the poster created to capture this unique event. The Rotary ‘Crocus Wheel’, comprises deep purple crocuses (Giant Ruby). The planting was part of Rotary’s ongoing Purple4 Polio crusade to eradicate polio across the world. The event was part of a national effort by Rotary Great Britain and Ireland to mark World Polio Day and Rotary's decade-long efforts to eradicate polio from the face of the planet. At present, this dreaded disease is only found in three countries. We're almost there! 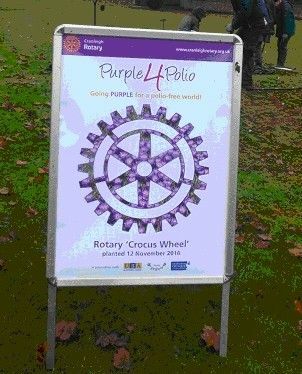 For further information see: www.rotarygbi.org/what-we-do/purple4polio/ .